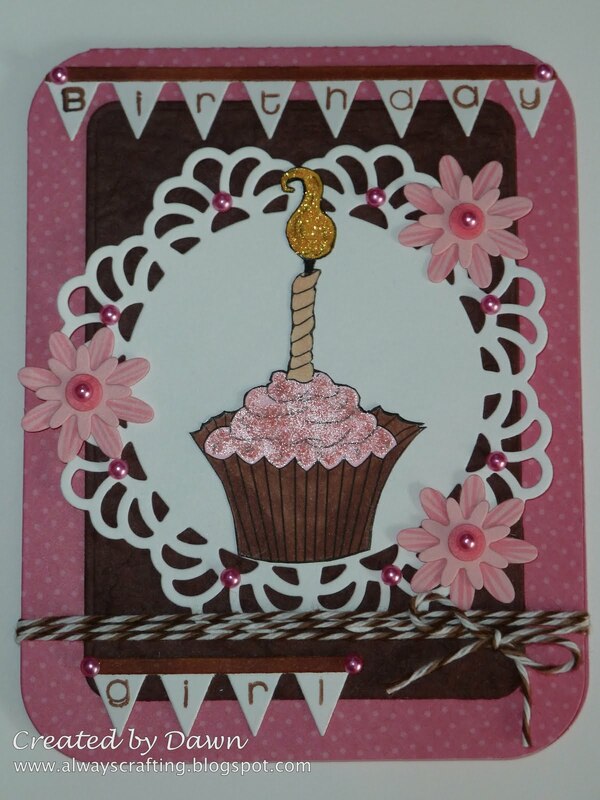 One Stop Craft Challenge is holding another challenge today with a theme of special birthdays! Please head over to the blog and enter your card here. Happy Birthday to our own Miss Shelley! She is turning 30 this week! We hope your 30th birthday is a special one! Please leave her some birthday love on the OSCC blog. Beautiful. Dawn the link is working the Doily and where did you find the Baker's Twine? The card is lovely. Great card, love the colour combo! Thank you for sharing with us at Craft Your Passion & CES Challenge this week, good luck! Love it! Totally love the sparkly cupcake! Thanks for joining us at Fab N Funky this week! Thank you so much for joining us at Crafty Catz A Challenge Quote/ Sentiment,. Love the card! The banner is something I want to try. Great inspiration! Cute card! Love those little banners! This is just darling! Thank you for joining us at Cute Card Thursday! Great birthday card Dawn, scrummy looking cake. Thanks for joining us for the Ellephantastic challenge this month.